My growing interest in Japan and its culture lead me to Haruki Murakami. 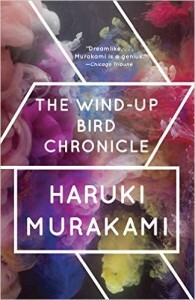 The Wind-Up Bird Chronicle was my introduction to Murakami’s work – I was surprised to learn that he was running a jazz club before he wrote his first novel at age 29. When I read non-fiction, I usually read to learn or be inspired. When I read fiction, I read to feel and dream. This book was extraordinary in conveying feelings and setting the mood for the reader. It starts as a metaphysical detective story, and continues like a fairy tale or a dream. It hovers so close around the edges of reality, and gradually, gets stranger and stranger as you read. The book doesn’t follow a traditional plot, but the journey is still worthwhile and the whole experience feels like watching a movie. As the protoganist, Toru Okada, goes through suffering, the reader suffers with him. Him facing death at the bottom of a well, the stories about Lieutenant Mamiya’s wartime experiences were all emotionally very touching and heavy. At an intellectual level, I have great respect for its complexity, richness at different layers and strong themes. My criticism is that at 600 pages, the book is too long and second half has unnecessary parts, making it feel fragmented and disconnected from the rest. It’s probably because the original Japanese edition was published in three parts, whereas the English translation omits certain chapters and combines it into a single book. Overall, it’s a chaotic read, but one of the best novels I’ve read at the same time. Highly recommended!